So there it is; the iPad mini isn’t quite as light as a pad of paper – at least our non-spiraled softback pad. There are certainly pads of paper that are heavier so Phil Schiller’s claim that it’s as light as a pad of paper is about right. It’ll certainly feel lighter than a can of coke in your hands, making it easier to hold in a single hand while you browse the web for long periods or read ebooks on the move. While lighter than the Kindle Fire (395g) and the Google Nexus (334g), the difference is probably too insubstantial to influence your buying choice. - therefore, the iPad Mini is "lighter" than a pad of paper? These guys need some lessons in logic, really...what a pathetic article. "So there it is; the iPad mini isn't quite as light as a pad of paper - at least our non-spiraled softback pad. There are certainly pads of paper that are heavier so Phil Schiller's claim that it's as light as a pad of paper is about right." Some lessons in reading, too. the iPad mini isn't quite as light as a pad of paper - at least our non-spiraled softback pad. There are certainly pads of paper that are heavier so Phil Schiller's claim that it's as light as a pad of paper is about right. Its weight is very close to the pad they had on hand, but it was a little heavier. Apple didn't say it was lighter than that specific pad of paper, and since there are heavier pads out there and the iPad Mini's weight is so close to this one, they say that his claim is most likely correct. God, is it so hard to read?? but we don't know how many pages of paper apple's pad of paper had..
Read this as, "Which Tests Phil Schiller's Weight." 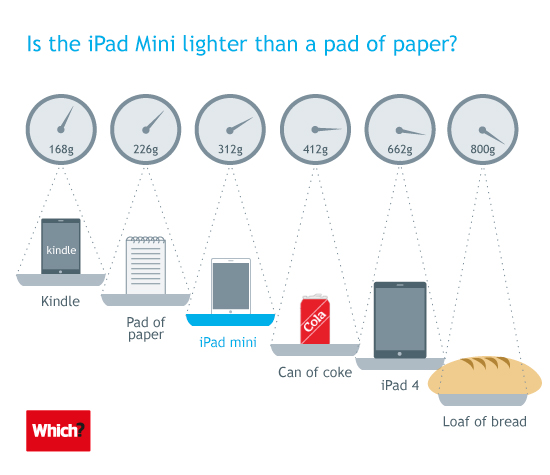 I am so happy to finally know that my soon to be iPad mini will be lighter than a loaf of bread. Do people REALLY get paid to do this? This is why we need the downvote button back. The fact that one of the top-rated comments comes from somebody who clearly didn't even read the article is just sad.